In September 2018, this chapter was extensively updated and should be reread. A Resource Panel will be established to agree financial requests for residential placements, residential staffing ratio costs and any therapeutic assessments/support packages. The Legal Planning and New Admissions Panel will meet every Tuesday from 9am to 3pm. The Court Progression Panel will meet every Thursday from 2pm to 4pm. The Permanency Panel will meet every Thursday from 10am to 12pm. The Resource Panel will meet every Monday from 2pm to 4pm. The panels should not be used to supplement assessments or undertake supervision or case management. This is the role of service and team managers. Managers and social workers attending the panels must ensure that the correct documentation is available to the panels in a timely way so that the discussions are purposeful. Managers and social workers will be held to account if there is a lack of compliance. Cases that are due to come to the panels must not be delayed as the whole purpose is to avoid any drift or delay. Equally if a case requires an urgent legal planning meeting, this should take place and not wait for a panel date. If a young person is not yet looked after and requires resources to prevent family breakdown, they should not wait for a panel and services should be put in place straightaway. The Menu of Services is available in the Document Library. Book onto the Legal Planning and New Admissions Panel. Initiate activity to ensure legal and emotional security at the earliest possible point. PLO pre-proceedings – exceeding 12 weeks. UASC where they have been accommodated under S20 for 6 weeks or more. S20 – emergency accommodated – Admission to care form to include case summary and proposed plan. S20 – request for accommodation – Admission to care form to include case summary and proposed plan. S20 – those accommodated longer than originally agreed – case summary, LAC review minutes and most recent care plan along with any other reports and assessments completed. LPM cases – SWET (whole form), any other reports and assessments, draft immediate issue letter or draft Letter before Proceedings, Parenting Assessment Plan. Unborn babies – SWET (whole form), pre-birth assessment (if completed), any other reports and assessments, draft immediate issue letter or Letter before Proceedings, Parenting Assessment Plan. Assessments completed and any relevant reports. Assessments completes and any relevant reports. Final Order and any documents to inform a discussion. Endorses the final Care Plan. Care Proceedings, checkpoint 2 – approximately 3 weeks prior to filing final evidence, date set at checkpoint 1 and is dependent on timetable for assessments. Any assessments/reports completed by order of the court. Any minutes from attendance at panel for checkpoint 1. Ensure permanence plans are progressed without delay following the final order being obtained. Consider financial requests for residential placements, residential staffing ratio costs and any therapeutic assessments/support packages. There will be a longer monthly panel which will consider all high cost placements to ensure care plans and step down plans are being progressed. Admission to care form, to include case summary and proposed plan. Case summary to include proposed plan (for children who have not remained in care following PP being taken). Minutes from attendance at previous panel date. Any minutes from attendance at panel previously. 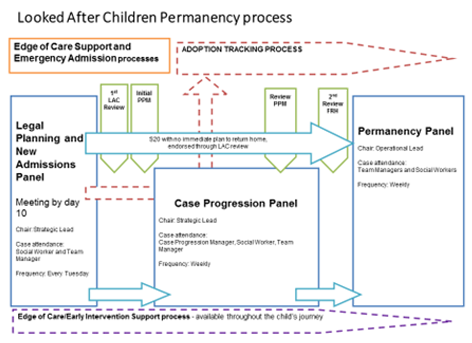 Copy of the final child in need plan to detail the action taken to date, whether any on-going monitoring is required and what the step down process will be. Draft initial statement and updated care plan. Draft initial statement and care plan, to include exit strategy.